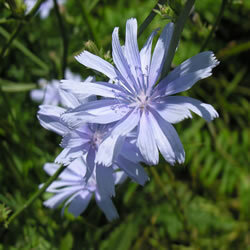 Chicory is a tall beautiful plant and although possibly not native to the UK has naturalised. The flowers are usually sky blue in colour and have 15-20 petals which open in bright light. It likes well drained soils (sand and chalk) and is often found on roadsides, rough grasslands and wastelands. It is an excellent plant to grow on infertile south facing slopes where it quickly adds colour and foliage. In the garden Chicory is best positioned behind other flowers against a south facing wall or fence. It is tolerant of cutting and grazing and the leaves can be eaten as salad leaves.